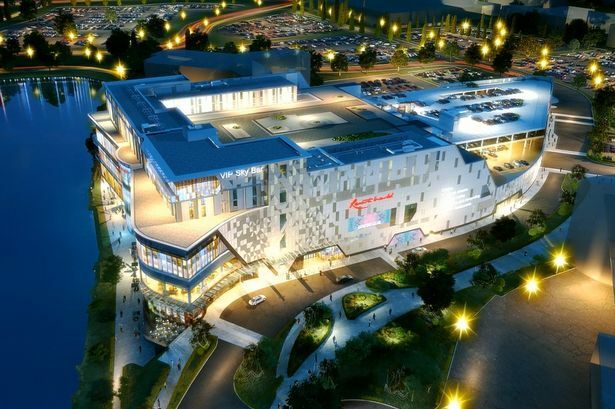 Cinema giant Cineworld became the latest major name to sign up with less than a year to go until Resorts World Birmingham opens its doors. A new 11-screen cinema, including IMAX and 3D screens, will form part of Western Europe&apos;s largest leisure development after a deal was agreed with the British chain. The line-up at the Genting UK development is starting to become clearer with The Vox, a 900-delegate conference centre, also announced in May. The long-proposed Arena Central development in Birmingham city centre took another significant step forward with the submission of a planning application for the first building. Called 1 Arena Central, it will be eight storeys and contain 135,000 sq ft of office space, 5,000 sq ft of ground floor retail units, 2,500 sq ft of open balconies on the top floor and 68 parking spaces, fronting onto Broad Street opposite the new Library of Birmingham. It was the first step towards the £400 million masterplan for the 9.2-acre site which has been on the drawing board for more than a decade. Selfridges announced it was making its largest investment in Birmingham since it opened 10 years ago, as the renaissance in city centre retail continues. The department store giant is investing £20 million in a major refit at its landmark shop, bringing in a host of new brands and creating about 70 jobs over two years. Redevelopment work, which has already begun, will see every floor at Selfridges receive a complete overhaul as the company targets a 25 per cent rise in sales. The first phase – which includes new dedicated menswear and womenswear floors – will be completed before Christmas, ahead of a major step forward for the city&apos;s retail scene in 2015. The former Birmingham City Council leader who launched the £600 million revamp of New Street Station blasted Network Rail for &apos;ruining&apos; his dreams. Lord Mike Whitby, who successfully campaigned for government funding to deliver the New Street Gateway scheme six years ago, lashed out at changes to the scheme. The peer said that changes would make the futuristic design look &apos;obsolete&apos; and questioned Network Rail&apos;s motives. The Birmingham Assay Office sold its landmark Newhall Street building to mixed-use developer TCN UK. TCN UK has proposed a mixed-use scheme which, the developer said, would seek to retain the character of the Grade II listed Victorian building where possible. Business leaders in Digbeth outlined concerns about pedestrian and cycle access to the city centre – and called for a major new promenade to be built. In a letter published in the Post, members of the Digbeth Forum say ensuring good pedestrian, cycle and public transport routes created through to the city centre are key to regenerating Eastside. A &apos;15 in &apos;15&apos; list of major events taking place next year was compiled by Birmingham&apos;s business tourism experts. The list was compiled by Meet Birmingham for business travel trade show IMEX, which took place in Frankfurt. New images of Birmingham&apos;s Arena Central development revealed wide public spaces including an urban meadow. Landscape architect Gillespies designed the public realm for the 9.2-acre site, including almost four acres of soft landscaping. Custard Factory-based animation company Yamination Studios played a key role in creating a national TV advert for the UK&apos;s biggest milk brand. The 30-second &apos;Barry the biscuit boy&apos; advertisement for Cravendale, which made its debut to six million ITV viewers, used an innovative mix of techniques including puppetry, stop motion animation and computer graphics to tell the story of the adventurous young biscuit boy Barry and his love of milk. The BBC announced it would base its centre for recruitment and talent development for the UK at the Mailbox in Birmingham. The BBC Academy, the BBC&apos;s centre for in-house and industry wide training, will move to the city in 2015, alongside the core of the BBC&apos;s HR and internal communications. The academy offers training and development for the UK broadcast industry and will also work will local companies to increase the talent base in the West Midlands.